Everybody knows about Doom. Even people who have never touched a game in their lives (I’m looking at YOU, current “Reactionist Politician of the Month”) know about Doom. For sheer fact of the press it received, it secured its place in history. But less publicized are the results of the expected corporate reaction to such a wild success – the greedy search for the game that would unseat Doom and rake in equal or greater profits. Oh, the quest for the “Doom-killer” is worth an article itself (or maybe even its own game! ), but ultimately, it fell to one game – before Quake came about and made things all real-3D-like. That game is not this one. But Blood is not to be marginalized. We will save that marginalization for its mediocre sequel. 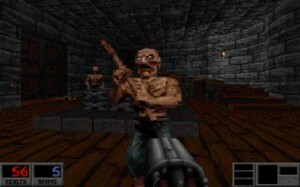 No, Blood is a cherished part of the Holy Trinity of Build3D – named for the game engine that powers them – Duke Nukem 3D, Shadow Warrior, and Blood. Each of these games took the versatile Build3D engine and made it their own in their own special way. 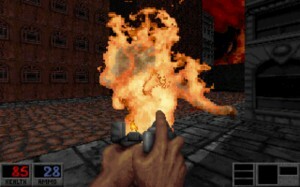 Before this game, the most violent, disgusting, horrible game imaginable was Rise of the Triad. It was meant to be the goriest game ever made. This game is the result of Monolith moving the bar up to 6’11” and clearing it by 70 feet. Blood is an FPS that camps on B-movie horror films. Dingy locations and outlandish situations are the order of the day. While there’s enough horrific imagery, supernatural nasties, and gore to consider this a true Halloween kind of shocker title, that’s clearly not the intent. This is supposed to be good, messy, cheesball fun. For example, the castle level is decorated like a midnight movie horror host’s set, complete with a Frankenstein’s lab chamber and bodies strung up under a sign reading “Test Subjects.” You’ll operate some gruesome machinery to get a key. You’ll encounter totally useless peasants that flail their arms around and scream “Help Meeee!” – naturally they blow up real nice. And anything particularly scary doesn’t look that way after you’ve blasted it to inert pulp with your various weapons. And that about sums up Blood. It’s a well-made game for sure, but one that doesn’t aspire to be anything more than a collection of haunted house scenery and violent death after violent death. Our game follows the antics of Caleb, who had something to do with the cult of an old Lovecraftian god, but fell out of favor, got shot like a bazillion times and buried… but now he’s back… and he wants revenge against the cult who has now taken over the world? I’m winging it at this point. The summary is that you’re an undead wisecracking gunslinger, with glowing red eyes and a penchant for mayhem. You have enemies all over the levels whom you will massacre. The plot, mentioned only in the manual, will be vaguely referenced through some truly heinous, early 3D cutscenes. Practically, it will factor in once in the game, when you come across the crushed body of your presumably former lover in the boss stage of chapter one, and Caleb shouts “No!” and then again a couple more times. Vidal Sassoon sends his regards. Blood isn’t the kind of game where you shoot enemies. Shooting enemies with a gun is simply not violent enough for this one. You get a double-barreled handcannon like Banderas had in Desperado to fling enemies across the room. You get a tommy gun that will make enemies do that “riddled with bullets dance” that Jimmy Caan did for an entire reel in The Godfather – and it takes about that many bullets to kill an enemy here. 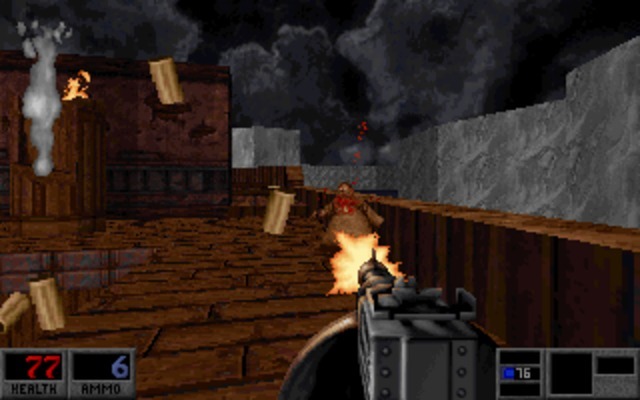 If you find the “guns akimbo” powerup, you can sport two tommy guns at the same time for particularly ruthless firepower. 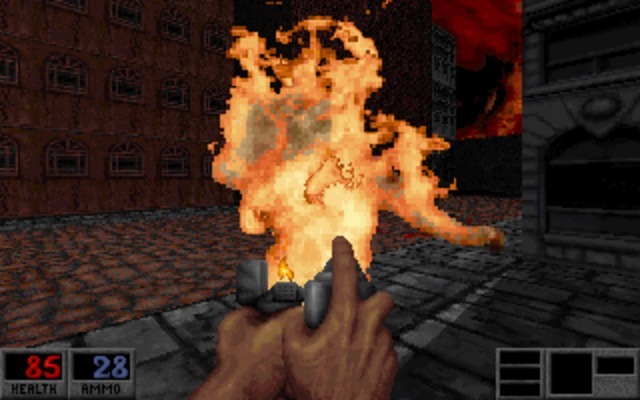 You get a flare gun that sticks a burning flare directly into enemies, and after a few moments of comical anticipation, sets them afire and running panicked. You get a can of hairspray and a lighter to flamethrow enemies and set them afire. You get a napalm cannon that launches burning globs and sets your enemies afire. And there’s a voodoo doll that bleeds enemies dry from afar. This is a game where you pitchfork off a zombie’s head and kick it around for fun. This is a game where you light a stick of dynamite and throw it into a room to the cackling laughter of your avatar. This is a game that found the sprite generating ability of Build, quite underused in Duke3D, to send streamers of crimson vitae streaking unto the walls with every shot, and has you picking up the still-beating hearts of your foes for health boosts. This is a game that glorifies violence against the undead and the satanic, and maintains a healthy level of dark humor the entire time. If you can use a remote explosive to dismember an enraged cultist into his fundamental parts, and consider it comic mischief, you are the target audience for this game. As with the other Build games, the engine is perfectly up to task here. It handles action well, even in clunky ol’ DOS, while making cities look truly convincing. It can believably render pretty much any scene you can think of, and provide all sorts of pre-scripted interactivity – used creatively by the design team. There’s the expected action inside mausoleums, funeral homes, and cathedrals (with zombies that claw their way out of the ground), but a few levels certainly go above and beyond. All Build games seem to have their “showcase levels,” and this case they would include a level on a speeding passenger train, a working amusement park with rides and boardwalk games you can operate, and a crumbling city under siege from demons. Variety is the spice of Build3D, and you’ll get plenty of it here, with solid FPS mechanics to support it. Also, thanks to its exceptional level of detail, especially with signs, decals, decorations, etc – you’ll get countless tongue-in-cheek references to classic horror films. Yes Virginia, there IS a level based on The Shining. I still like Blood far more than current “throwback” FPS’s like Painkiller or Serious Sam. Those feel like they were trying far too hard to replicate something that already existed in the form of games like this one. It’s slower than Doom, both in engine speed and pacing, but the tradeoff is some magnificent locales, some truly nasty effects, and a lot of fun all around. If you’re morally objected to such games, I think you already know what you’re not going to like about this one. If you want to be Ash mowing down Deadites, complete with a gravelly-voiced character tossing perfect one-liners like pennies into a fountain, then hopefully I’ve convinced you where to go. Pretty damn fun all around if FPS’s are your bag. Nearly unparalleled variety in weapons and locales. Greatest character voice and lines since Duke Nukem. Pesky to run on modern systems, some pretty dull levels mixed in with the stellar ones. Your grandparents had great taste in video games 🙂 Thanks for reading! I played this game many years ago, but never had a chance to bring my gameplay to any logical conclusion. Now, bought this one at GOG and finished it in a week or so, had a lot of fun! I think of preferring it to Duke 3D, though: there’s more atmosphere and content. Oh, there’s one thing that not everybody know: “Thchernobog”, the Lovecraftian god, is translated from Russian to “Black god”, literally, or “Dark god”, as stated in Blood 2. I’m not sure, if they picked the name up from an existing source or just tossed it in. Anyway, here we are. Is the controls playable for someone who always use source ports for 90’s games? What other id Tech 1 and Build engine games would you recommend? Well, most of the highlights are scattered around the site. You can search using the FPS tag. Shadow Warrior, Duke3D, and Blood form the Build Trinity. Redneck Rampage is a good time as well. As for controlling Blood without a source port, make sure to run setup.exe within DosBox. There will be a Controller Configuration option that will let you rebind every key on the keyboard. Easy enough to set up a familiar WASD scheme, or something else away from using the arrow keys. Returning to the “horror” territory, just to speak, we haven’t seen the Halloween specials this year. What happened? Sorry about that! I just got married last month, so things have been far to hectic to play the usual Halloween amount. I did/do have one in the queue I THOUGHT would make it in time, but in the process of writing I realized I need to spend more time with the game. Lots of little questions about how systems could work that I need to answer first. Sorry also I haven’t been spending too much time on here. Thought no one would really notice, but I can’t tell you how nice it is to hear that people miss the reviews. Definitely helps me want to find the time. It’s great to hear that you have found the right person! It doesn’t happen so often, so please accept my best and sincere wishes for your life together! You’re busy, it’s perfectly understandible, so don’t worry if you have to take your time for the reviews. Your loyal readers will be here, waiting for new material! Well, I’ll be here for sure, as always. Does your admin@JGR address still work? I sent you an e-mail, not recently, but not sure if you received it. I would like to keep in touch, if you don’t mind.